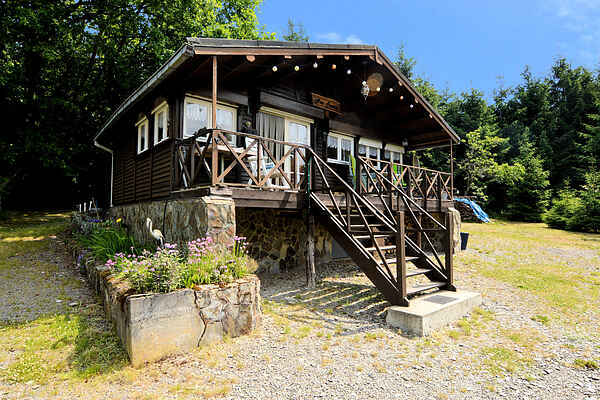 When you go up the mountain via a small road near La Roche, you get to this quietly located, cosy chalet. There is one bedroom, making it an ideal destination for a couple but, as the couch in the living room can be turned into a bed, it can also easily be used to accommodate four. The interior is atmospherically furnished and when the wood-burning stove crackles it only adds to the character of this accommodation. When the weather permits, you can also enjoy yourself outside. There are two terraces, one in front and one behind the house. There is of course also the large garden. Situated by the edge of the woods you can seek sun or shade. And because the garden is fully enclosed, a dog can walk around here without the risk of him leaving the premises. La-Roche-en-Ardenne is an attractive town in the heart of the Ardennes, where you can find plenty of shops and restaurants. Durbuy is also easy to reach from here. Nature and the sloping landscape are perfect for walks or cycling trips.